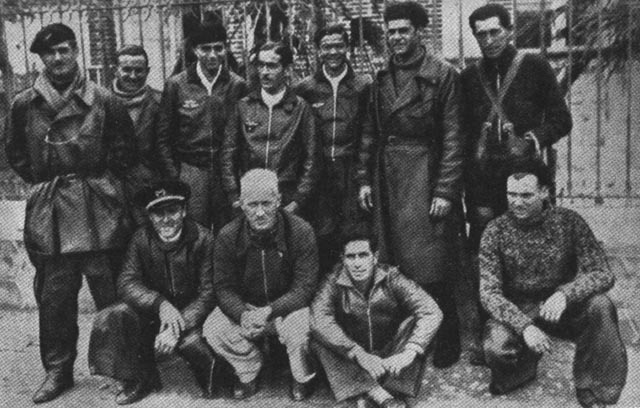 Back row from left: Frank Tinker, mechanic, José Riverola Grúas, Gil, Castenada, Captain La Calle, Velasco. Andrés García La Calle was born in Sestao (Biscay) on 4 February 1909. His real name was in fact García Calle, but when he joined the armed forces an old sergeant told him to say La Calle instead of Calle so people might think he was related to an assistant minister of the times and that is how he became García La Calle. He gained a private pilot’s licence at the Madrid Aero Club in 1929, flying the Avro 504. In October of that year he was admitted to the Escuela de Vuelo y Combate at Alcalá de Henares. He later attended the Escuela de Transformación (Transitional School) at Guadalajara, from which he graduated as a military pilot. García La Calle was initially posted to Auamara, in Larache, then to the Escuela de Observadores at Cuatro Vientos and, finally, to the Escuela de Tiro y Bombardeo at Los Alcázares. There, he flew DH 9s, before moving in 1932 to Loring R-III-equipped Grupo de Reconocimiento No 22 in Seville. He was promoted to sargento piloto in 1934. La Calle distinguished himself in the early engagements over the Sierra de Madrid by shooting down several Nationalist aircraft and logging an impressive 82 flying hours in the second half of July alone. During this time the future ace flew Ni-H.52s, D.372s and Loire 46 C1s with the government’s Aviación Militar. Later, Garcia La Calle was detached to Herrera del Duque and Don Benito airfields on the Extremadura front. On 21 July 1936, La Calle (Ni-H.52) claimed a damaged Breguet XIX. He claimed his first victory on 25 July, when he claimed a Breguet XIX. Sargento La Calle of Grupo No 11 at Getafe crash-landed Ni-H.52 ‘11-33/3-58’ on the Madrid sierra on 28 July, where it was profusely photographed and presented by both sides as “a shot down enemy”. He claimed a Breguet XIX on 30 July. On 6 August, cabo Rafael Peña Dugo of the Grupo de Caza No 11 (Ni-H.52) attacked friendly Ni-H.52s that had taken off from Barajas. Sargento La Calle suffered a buttock wound, but escuadrilla CO, capitán José Méndez Iriarte, crashed in enemy-held territory and was killed. In August, sargento La Calle’s fighter patrulla, made up of a Hawker Spanish Fury and two Nieuport Ni-H.52s flown by cabos Roberto Alonso Santamaría and Rafael Peña Dugo, moved to the Herrera del Duque and Don Benito airfields at Extremadura. The unit was commanded by teniente Ramón Puparelli Francia. While flying Hawker Spanish Fury ‘4-1’ from Talavera de la Reina on 30 August, sargento La Calle of Escuadrilla Mixta claimed a Ju 52/3m. On 31 August, sargento La Calle (Hawker Spanish Fury ‘4-1’) lead a fighter patrulla of two Ni-H.52 from capitán Juan Quintana y Ladrón de Guevara’s Escuadrilla Mixta, based at Talavera de la Reina. The two Ni-H.52s were flown by cabos Roberto Alonso Santamaría and wingman Rafael Peña Dugo. Both Roberto Alonso Santamaría and Rafael Peña Dugo were promoted to alférez after this success. While flying Hawker Spanish Fury ‘4-1’ from Talavera de la Reina on 2 September, sargento La Calle of Escuadrilla Mixta claimed a Ju 52/3m. His record in the Talavera battles was outstanding, and he was promoted to alférez on 3 September 1936. He claimed a CR.32 while flying Hawker Spanish Fury ‘4-1’ from Talavera de la Reina on 16 September. Some authors have attributed this victory to French pilot Jean Dary. According to La Calle, alférez Rafael Peña Dugo, who had by now distinguished himself as a fine shot, downed the tri-motor. Everything seems to point to the conclusion that Dary, who also claimed two Ju 52/3ms in head-on attacks, was a member of the attacking Republican patrulla, however. The victory should, therefore, have been attributed jointly to the entire D.372 patrulla. It also seems that while flying Hawker Spanish Fury ‘4-1’ from Talavera de la Reina, alférez La Calle of Escuadrilla Mixta claimed a Ju 52/3m during the day but this is perhaps a share in the above aircraft. La Calle continued flying the last remaining fighters available in Madrid until 28 October, when he left for Barcelona on leave. The Soviet command in Spain eventually permitted the best Spanish fighter pilots to join the two escuadrillas that had been established upon the I-15s’ arrival. Aviators such as La Calle, Fernando Roig Villalta and Augusto Martín Campos soon began flying the biplanes, and although the latter pilot was quickly dismissed because the Soviet command did not trust him, further Spanish pilots joined the escuadrillas. They included José Cuartero, Emilio Galera, Jesús García Herguido, Alfonso Jiménez Bruguet, Manuel Aguirre López, Roberto Alonso Santamaría and Rafael Robledano Ruiz. La Calle was transferred to the 1a Escuadrilla de “Chatos” at Alcalá de Henares, in Madrid, commanded by the Russian volunteer, Pavel Rychagov in October and with this unit, he took part in the defence of Madrid from 4 November 1936. In November, the Soviet I-15 escuadrilla (1a/Gr.26) led by kapitan Pavel Rychagov at Alcalá de Henares, in Madrid, included tenientes La Calle (he was promoted to teniente during November), Roberto Alonso Santamaría, López Trinidad, Galera Macías, Cuartero Pozo, Guaza Marín, Roig Villalta, Jesús García Herguido, Jiménez Bruguet, Manuel Aguirre López and Robledano Ruiz. The escuadrilla fought on the Madrid front. La Calle initially flew as a wingman in the patrulla led by Soviet pilot kapitan Ivan Kopets. Later, La Calle became patrulla CO after Kopets assumed command of the Escuadrilla Rychagov when Rychagov was removed from frontline duties. Soviet sources credit La Calle with an aerial victory during this period. Le Calle initially flew as a wingman in the patrulla led by Soviet pilot kapitan Ivan Kopets. Later, La Calle became patrulla CO after Kopets assumed command of the Escuadrilla Rychagov when Rychagov was removed from frontline duties. Soviet sources credit La Calle with an aerial victory during this period. He seems to have claimed a He 51 flying the Polikarpov I-15 before 9 December 1936. La Calle was put in command of the 1a Escuadrilla. Initially it comprised three elements. The 1a Patrulla consisted of La Calle, José Calderón, Ramón Castañeda di Campo and Ben Leider, the 2a Patrulla comprised of Jim Allison, Frank Tinker, Harold Dahl and José ‘Chang’ Sellés and the 3a Patrulla was made up of Luis Bercial, Esteban Ortiz, José Riverola Grúas and Gerardo Gil Sánchez (who joined the unit on 10 February). At the same time La Calle’s 1a Escuadrilla remained on the Madrid front. On 10 February, he claimed a CR.32 over Araganda in the Getafe area. Teniente La Calle claimed a He 51 on 13 February. During February, La Calle was promoted to capitán. The Escuadrilla leader La Calle’s version of Leider’s end differed markedly from Tinker’s perspective. As Leider dived, breaking away from the ”Lufbery circle” to attack a “Heinkel” below, an enemy fighter locked on his tail. La Calle pulled behind Leider’s pursuer and frightened him away with his machineguns. Repeatedly La Calle then tried to herd Leider’s intended victim back away from Nationalist lines so that the American could down the enemy fighter. La Calle wanted Leider to destroy the enemy fighter as a morale boost for the Escuadrilla and to appease Leider’s Communist backers. When the Nationalist pilot made a third attempt to cross his lines, La Calle shot him down. Irritated by the turn of events and Leider’s seeming inability to shoot down his adversary, the Spanish Commander signalled Leider to head for home. During the flight back to base, Leider flew just behind the Escuadrille leader’s wing. Halfway home, La Calle glanced around only to discover that Leider was gone. Having landed he learned that no one knew of the American’s whereabouts: his comrades saw him rejoin their homebound group and never again. There was no other news until Leider’s ”Chato” was located. According to Frank Tinker, by the time the Jarama battle ended on 27 February, La Calle had been credited with 11 victories. The American ace rated him a good CO, but future ace Francisco Tarazona Torán and veteran fighter leader Juan Sayós Estivill, both of whom later came under his command, did not share this opinion. Capitán La Calle’s 1a Escuadrilla participated in the battle of Guadalajara in March, during which “Escuadrilla La Calle” suffered the loss of teniente piloto Antonio Blanch Latorre of the Aeronautica Naval. Guatemalan pilot Manuel García Granados was also shot down on 20 March. On 13 March, capitán La Calle claimed a damaged S.81. On 20 March 1937, the 1a Escuadrilla (”Escuadrilla La Calle”) took part in the last aerial combat during the battle of Guadaljara. They took off in four patrols, led by La Calle, Harold Dahl, Frank Tinker (CA-056) and the Guatemalan pilot Miguel García Granados, and were soon involved with three bombers and 20 Fiats. Granados patrol was jumped by the Fiats, which had been patrolling in a higher altitude, and in the first hail of bullets Granados was shot down. Tinker gained his second victory (M. Scala KIA? ), and from the two squadrons of fighters taking part five Fiats were destroyed. Capitán La Calle’s 1a Escuadrilla fought on the Teruel front from early April through to 24 May. In May a second group of Soviet volunteers arrived with another batch of 31 Chatos arrived from the Soviet Union, taking the total number supplied to the Republicans to 116. These new fighters greatly enhanced the strength of the I-15 Grupo. Initially, these new aircraft were used to fly patrols over the Mediterranean coastal zone from Cartagena and Elche to Alicante, protecting Republican warships and cargo vessels. This mission had initially been performed by the I-16s, but following the redeployment of the latter type to the north, and the poor quality of the latest batch of Polikarpov fighters to reach Spain, the I-15 Grupo was given the task of coastal patrolling. The pilots assigned this role formed the backbone of the 1a Escuadrilla, which had been placed under Kapitan Ivan Yeremenko’s command while La Calle was to undergo further training in the Soviet Union. On 20 June, capitán La Calle went to the Soviet Union as an accompanying instructor for the second pilots’ course. The party crossed into France at Port Bou and sailed for the USSR aboard the French ship SS Téophile Gautier. Following hospital treatment for a minor heart ailment once in the Soviet Union, La Calle was sent to No 20 Pilots’ School, which had been established to train Spanish aviators at Kirovabad (now Ganja) in the northern Caucasus. He commanded it jointly with a Soviet officer. Capitán La Calle returned to Spain from the Soviet Union on 3 March 1938. After a series of Nationalist raids on Barcelona, he was placed in charge of the air defences of both the city and nearby coastal region. In May, capitán La Calle was ordered to form the Grupo No 28, which was equipped with Canadian Car & Foundry-built Grumman GE-23 Delfin biplanes that were to be used for ground attack and coastal patrol duties. As CO, capitán La Calle participated in the early stages of the battle of the Ebro, although in reality he did little flying as he was attached to the command post of general Rojo and coronel Modesto as Aviación liaison officer. On 5 May, capitán José Riverola Grúas became deputy CO of the new Grupo de Asalto No 28, which was based at Cardedeu airfield. During the month, Juan Lario Sanchez was posted to the Grupo and he remained at this unit until the end of the war. From August, capitán La Calle operated with his Grupo No 28 (Grumman GE-23 Delfin) at Lérida. In October, capitán La Calle handed over command of the Grupo No 28 (Grumman GE-23 Delfin) to mayor Antonio Saluela Lucientes, having been appointed deputy CO of the Escuadra de Caza No 11, replacing mayor Manuel Aguirre López. In November, La Calle was promoted to mayor. On 22 December, during the battle of Catalonia, mayor Isidoro Jiménez García handed over command of the Escuadra de Caza No 11 to mayor La Calle and returned to the Escuela de Alta Velocidadat El Carmolí as Jefatura (CO) where he remained until the end of the war. Escuadra de Caza No 11 was successively led by mayores Ramón Puparelli Francia, Luis Alonso Vega, Isidoro Jiménez García and La Calle. All tried their best to control the unit's activities, but only La Calle had significant experience of fighter operations. The Jefatura (Staff) of Escuadra No 11 merely acted as the conduit for orders from the Fuerzas Aéreas headquarters, of which there were two from April 1938 when government territory was split at the province of Castellon. One headquarters was based at Barcelona and the other at Albacete. Mayor La Calle, the official hero of the government fighter force, tried new methods and tactics and replaced several of the escuadrilla COs but to avail. During the war, La Calle claimed 11 biplane victories. On 6 February 1939, the Bf 109s of Legion Condor made a number of claims when the Geschwaderkommoder of J/88, Hauptmann Siebelt Reents claimed an I-15, as did Unteroffizier Gerhard Halupczek (1.J/88) while Unteroffizier Hans Nirminger (1.J/88) claimed a Ge-23. Unteroffizier Heinrich Windemuth also claimed a Ge-23 while Oberleutnant Alfred von Lojewski claimed an enemy aircraft; these two last claims is somewhat uncertain on the date. J/88 suffered its last operational loss when Unteroffizier Windemuth was killed when his Bf 109E-1 was shot down in flames during a low-level attack on Vilajuiga airfield. In the same attack was also Unteroffizier Nirminger shot down but he survived this. Four Republican pilots managed to scramble. The first to take off was Mayor La Calle CO of the Escuadra de Caza No 11 in his last I-16 fighter. He was followed by another pilot (Batista), and they took the direction toward France. Behind them teniente José Falcó Sanmartín, CO Patrulla de Vuelo Nocturno (I-15), was faced with two Bf 109s. There was an intense exchange of shots, and Falcó was sure that he had hit one Bf 109. When he had already taken the course toward the French border, he saw that other German fighter was pursuing a Republican Grumman Ge-23 “Delfin”. Mayor La Calle flew to France (Toulouse-Francazal). He stayed in a refugee camp in the area of Argeles-sur-mer in Perpignan, France. He was expelled from the Dominican Republic after a visit to Franco’s Spain by the Dictator Rafael Trujillo. He moved to Chile and some years later, he moved to Mexico. La Calle wrote one of the earliest and most popular - if somewhat unbalanced - memoirs of a Spanish Republican fighter pilot, entitled Mitosy verdades; la aviación de caza en laguerra española. Two years before his death, he moved back to Santo Domingo (Dominican Republic) where he passed away in 1976. His two sons, one of them a famous actor in Mexico TV- Andres García – and a daughter, survived him. Biplane victories: 11 destroyed, 2 damaged. TOTAL: 11 destroyed, 2 damaged. (b) The CR.32s claimed 5 and 6 probable I-15s and 7 and 3 probable I-16s shot down with 2 CR.32s damaged. Republican pilots claimed 7 enemy aircraft for the loss of 6 aircraft. Additional information kindly provided by Simon Buckley, Eugenio Costigliolo, Santiago Flores, Stefano Lazzaro, Jose M. Paliza and Ondrej Repka.